Our region will soon become North America’s largest Food and Farming Cluster. From Niagara/Hamilton/Halton/Peel/York/Toronto/Durham, the Golden Horseshoe Agriculture & Agri-Food Strategy will continue to grow following its 2012 launch. Our good soil, moderate climate, sufficient water, numerous cultures, maintained infrastructure, plentiful food processing facilities, and an abundance of food service enterprises all contribute to success. Currently, over 200 crops contribute over $33 billion to our economy. WOW! This makes it the region’s largest industry. Nevertheless, we import more foods than ever. As our population rapidly increases; our own food production is actually decreasing. So there is plenty of room for more growth! I sincerely hope that solving this conundrum is our new Premier’s reason for also becoming our new Minister of Agriculture and Rural Affairs. Ace Bakery is now searching for 20 deserving artisans to join their Artisan Incubator. If you think you have the inspiration and the energy to qualify, then submit your profile. View Food News Today for a video summary of trends. 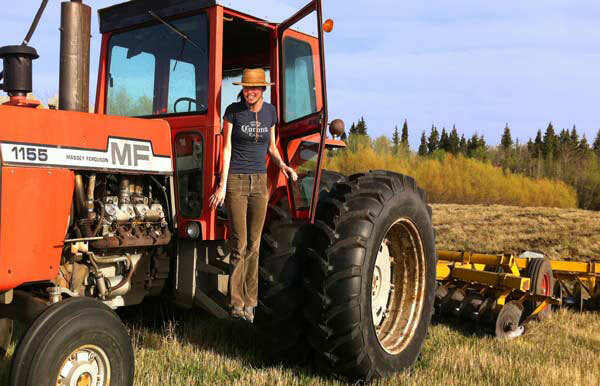 Lisa Mumm loves driving the tractor on her family alfalfa seed farm. 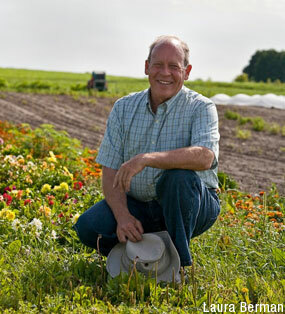 It was 25 years ago that I started purchasing Organic seeds from Jim Mumm. He reliably supplied the best quality sprouting seeds from his farm on the northern edge of agriculture in Saskatchewan. While ordering many tons of seeds, we sometimes talked about our growing children – and their leaving home. It was a great pleasure to meet Lisa Mumm who was a keynote speaker at the 2013 Guelph Organic Conference. She had left the Saskatchewan family farm for a McGill law degree and to experience big-city life. But she returned to the farm in 2009. Lisa fears her family Organic seed production business may become another of the 144 family farms being sued by Monsanto (plus hundreds more secretly settled out of court) for unwittingly growing GM seed. So she has become active in the Organic Seed Growers and Trade Association (OSGATA). Please view this presentation at the James Beard Foundation Food Conference. There have long been questions about the short (90 day) test periods to prove the harmlessness of GM seeds grown with glyphosate (Roundup®). Gilles-Eric Séralini (Professor of Molecular Biology at the University of Caen, France) led a team of researchers in a two-year study of the effects of feeding GM corn to rats. The study (released in 2012) is raising serious concerns about the safety of GM foods. Professor Séralini will be a keynote speaker at the 2013 Organic Consumer Conference to be held February 16th at the University of Toronto. The conference always includes a great organic lunch and enlightening workshops. , North America’s fourth largest crop (used for animal feed), has no practical need for Roundup® herbicide tolerance. But this technology would quickly pollute all alfalfa by wind pollination. that grow much faster and larger have been developed in PEI. A US company now wants to raise these engineered fish in Panama. resistant to browning are being developed in BC. But chefs know that the Cortland variety (first bred from Ontario’s McIntosh in 1898) remains sufficiently resistant to browning. All of these are solutions in search of a problem. Since these are all reproducing life-forms, their release into the environment is permanent. As we can expect to learn about unforeseen problems these novel life-forms cause to the environment or in our bodies, these “solutions” can never be returned to the lab. or raise a maximum of 300 birds for $0. But these must be slaughtered in a registered abattoir, and then may only be sold at the farm-gate. There needs to be an intermediate third option. Many readers had not been aware of why they had to drive to a farm to obtain a chicken with the scrumptious flavours they remember from decades ago. I also received a comment from Cathy McGregor Smith who is one of a few farmers to obtain an intermediate quota issued by Chicken Farmers of Ontario (CFO). They purchased this in 2004 and, “It is one of the best decisions we ever made.” CFO does have a new (2012) New Entrant Program whereby new farmers may purchase a full quota over a 15-year period. But this only creates another bland mono-crop farm. As farmers around the world know so well, chickens for both eggs and meat are very well adapted for a mixed farm. And so are dairy cows for milk and cheese. Currently, the only readily available alternative to bland is a policy for cheese. If a committee of bureaucrats deems that a cheese doesn’t taste like any other Canadian cheese, the maker need not pay for quota. Might a similar policy work with chicken? eggs? or milk?